Why does Space2Create put so much effort into exhibitions? Well there are actually some very good reasons. We use creative activity to improve the mood and wellbeing of individuals suffering a wide range of problems. They come to us because they feel better as a result and they gain positive benefits from participating. Having an exhibition gives purpose to activities we run. The people taking part know there is an end result and a reason for what they are doing. Then there is the effect actually seeing your artwork framed and hung in an exhibition has on the self confidence and esteem of an individual. Especially one who had been smothered and crushed by some terrible life circumstances. This is further enhanced when they hear the positive support and comment from visitors to the exhibitions. 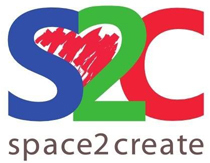 The exhibitions are part of the service we offer at Space2Create to support individuals and help them increase positive attitude. That’s why we value every visitor to our gallery. Coming top visit us not only boost our service users and volunteers but also gives you a chance to see some very creative artwork. You can learn how art helps improve lives, see ideas for being creative and also feel more positive yourself! Most artwork is for sale so you can also support the artist and charity by buying art. Selling work pushes the positive impact just a little higher and also raises much needed funds for Space2Create. Next time you see an exhibition advertised why not give half an hour of your time to come and take a look. That half hour can have a massive impact on somebody’s wellbeing. fading back into it’s accidental origins. been secretly staring back at me. Following on from our collaboration with local GPs at Helme Chase, Space2Create is delighted to announce we now have artwork at the Maude Street Surgery. The artwork on show is by S2C members and local artists. All is for sale with 20% of prices going to support S2C. Many thanks to Dr Maria Martin for her support, Claire Griffel for facilitating and organising the exhibition and to Jamie Barnes for helping hang the work. We look forward to hearing people’s comments. This kind of exhibition gives a massive boost and sense of purpose to those participating. It also showcases local artists and helps lift the mood of those attending the surgery. We are happy to display artwork at any location so if any local business, shops, offices or council location is looking to brighten their walls please get in touch. Details of our forthcoming exhibitions will appear here when confirmed.